Persian Big Apple Treats | Made by Angie with saffron, pistachios, rosewater and a big dollop of friendship! Hi everyone! As part of the continuing series of guest posts scheduled while I’m off on my excellent adventures in Iran, this post is by the lovely, artistic and witty Angie of the Novice Gardener. Angie does everything beautifully – cooking, gardening, baking, writing, blogging, guest blogging — with an offhanded and effortless enchantment and a vibrant sense of infectious excitement. She also throws awesome and rowdy Fiesta Friday Parties. (If you are a food blogger, you should RSVP a resounding yes to the next one!) And in the same vein of just being an awesome person, she generously insisted on creating a Persian inspired recipe specifically for Fig & Quince! How did I get so lucky? I’m stunned by the beauty of these treats she’s made and beyond touched by the beautiful gesture of her friendship. Now let’s go and nibble daintily this charming and delicious morsel and treat! She’s a little bit Iran, she’s a little bit NY. That’s Azita, Iranian born, Brooklyn bred. By the time you read this, she will already be in Iran, fulfilling a life-long dream of traveling back to a place where it all began for her. Good grief, that sounds too serious, but anybody who reads her blog knows that Iran runs deep in her veins. My thought on hearing the news was very much like how I felt when a close friend found her dream job in a far-away place. I was excited and happy for her, yet sad that I wouldn’t be able to see or talk to her anytime I wanted to. Thankfully, with the internet and Skype, the distance was made shorter. I expect the same will be the case with Azita. I expect that she will stay in touch and keep us abreast with all the merriment she’ll be having. I have a feeling she’ll have the time of her life. She is saying she’ll be staying for about 2 months, give or take, more or less, approximately. Is there a catch? I’m thinking there’s a chance she might like to extend her stay. I’m thinking that 2 months can possibly stretch into 3, maybe 4. I’m thinking there’s a likelihood that she will forget about us. I’m thinking there is a need to remind her that there are people waiting for her here, in her other home. And I’m thinking we need to send her off in style. So, I’m sending her off with these special treats that doubly serves as a reminder. I call them the Persian Big Apple Treats. It’s a little bit Iran, it’s a little bit NY, just like Azita. Persian because of the saffron and pistachios and rose water and NY because of the apples. 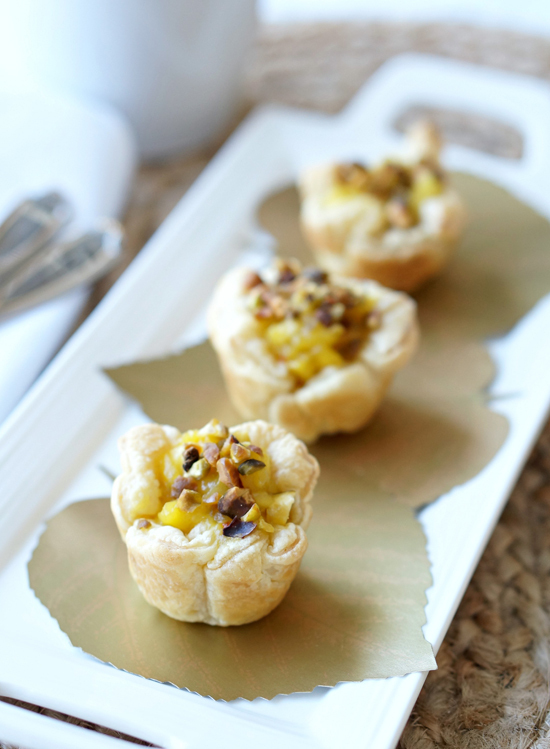 Apple pastry with pistachios, saffron and rosewater. YUM! And I’m thinking let’s not say good-bye, let’s say instead, au revoir. Au revoir, Azita! Until we meet again! 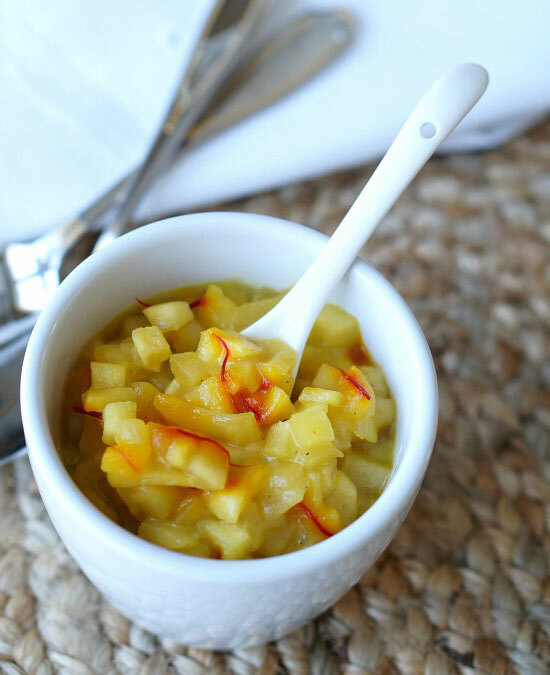 In a saucepan, over medium-high heat, cook the apples until they are cooked but not mushy. Mix the sugar with the flour and cardamom. Sprinkle over apples and stir to mix thoroughly. Add saffron threads and rose water and continue to cook until sauce is thickened. Cut pastry into 3 x 3 inch squares. You will get 16 squares. 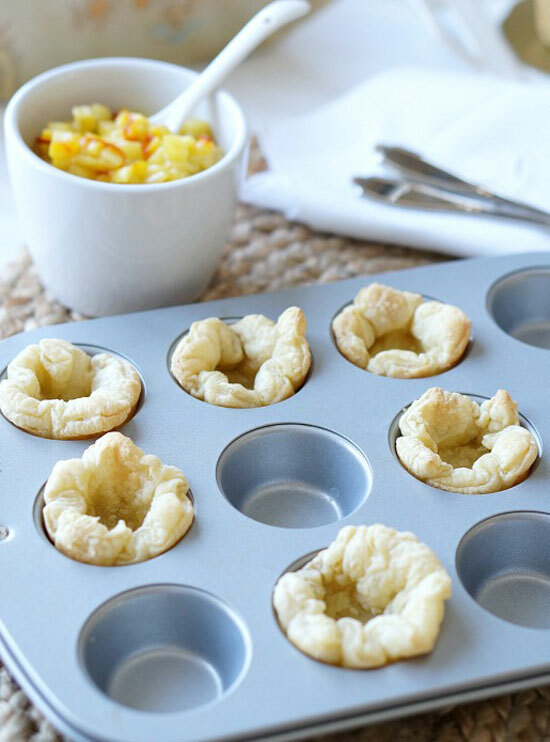 Fit the squares into mini muffin pan, pleating the corners so they will form a cup. You can clip the corners for a more rounded shape. Bake in a 350°F oven for 10 minutes, just until pastry is cooked but not brown. If centers of “cups” puff up, just push them down with a small spoon. 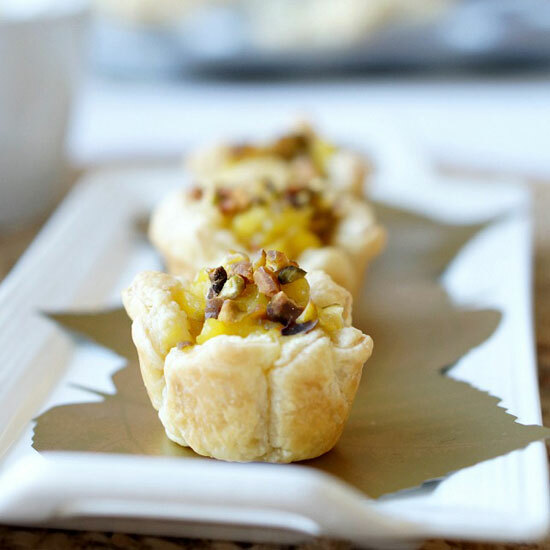 Fill each cup with 1 or 2 teaspoons of apple filling, sprinkle top with chopped pistachios and return to the oven for an additional 7-10 minutes, or until golden brown. Thank you Angie joon for graciously allowing me to post one of your beautiful recipes! And you guys, don’t forget to keep in touch with me while I’m away via Facebook and Twitter. or Instagram. Miss you and I’m waiving hello all the way from Iran! Wow! I’m going to try these this week. Love cardamom and saffron. Thanks, Jillian! Missing Azita so much right now! A creative recipe from a creative Angie! A very kind and touching narrative, a send-off for Azita! Bravo! Thank you, Fae! Wish I could have talked to you before you embark on your world tour, but will do as soon as you return. I’ll be waiting, impatiently! 🙂 2 months is a looong time! Beautiful and delicious. What a gorgeous treat, Angie it’s wonderful!! So yummy. Never thought to pair apples w all the usual suspects! Thanks, Coco! I will have to say that I only thought of the recipe b/c I had the perfect muse. Wouldn’t you agree? Just beautiful. Well done, Angie! I’m thinking many, many of you are missing Azita@Fig & Quince intensely right now. I’m thinking if you make these, you might be able to manage that feeling a little better. These are just like Azita. They’re a little bit Iran, a little bit NY. Hi! I’m an italian food blogger, i follow your blog, i like it! greetings from Italy!!! Ummm, looks fantastic! Such a sweet treat for a sweet friendship. What an awesome recipe! And I am glad that you mentioned Angie in first few lines of your post which stopped me at your post :). Happy voyage to Iran, Azita! And yes, Angie is a magician with a golden touch! Loved these tarts :). My mouth is watering… these look like they might just melt in the mouth! Hi Liz! They were sort of good, only a few chews and a big gulp needed! Aww.. that is such a lovely post and of course a great recipe too. Love the combination of ingredients. Can’t wait to try these! Apples are at their peak here at the moment, so will be absolutely perfect for this recipe. 🙂 Thanks Angie… and Azita, I hope you’re having the most wonderful time exploring Iran! Kept forgetting to hit reply button before replying, duh! Hope you got the message. Love the “winning couple” attribute, Margherita! A & A duo strikes it big, lol… Someone else mentioned that idea recently to me, hmm…. These look delicious. Have added to my ‘must make’ list. Lovely little parcels, and served with a big dollop of friendship makes it even more special. Is the rosewater more detectable by smell or does it have a flavor and if so, is it very sweet? Only for you, Sue, I went ahead and tasted the rosewater. Have you ever accidentally ingested perfume? Don’t ask me how I knew, but that was what it tasted like. Not sweet at all, no taste, just “perfumey.” I’m guessing it’s used to add flavor and fragrance, very much like vanilla. I put very little in my apple filling, so the smell was very subtle. Now that’s a committed blogger-friend! Okay, now we both know! GAH! Your photos should be illegal! I don’t even bake but I think I have to try these. They look so yummy. YUM! I want to have people over just so I can make these, or maybe I’ll make a whole tray and eat them myself!